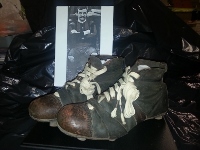 A pair of boot that were used by striker George McNicol back in 1904/05 has been saved from a sad fate. The boots had been rescued from a skip at Pittodrie back in 1993 and then lain unidentified in a shed for twenty years. As soon as they were show to the Trust the significance of the boots was realised when the name of George McNicol spotted scratched into the leather inside the uppers. It is believed that these may very well be the boots that McNicol wore when playing for the Black and Gold against Renton at Dens Park in the Qualifying Cup Final of November 1904. McNicol was the scorer of the two goals that brought the first National piece of silverware back to Pittodrie, much to the delight of their followers and the whole City of Aberdeen. McNicol was at Pittodrie for two seasons, making 27 appearances and scoring a healthy 14 goals before leaving the Club as it strove to build a stronger, more competitive side. The boots, which still have mud and chalk sticking to the soles, were in very poor condition but the Heritage Trust immediately took them to conservation experts at Hopetoun House and paid £300 to have them very carefully cleaned and conserved so that they can be seen by Dons' fans now and far into the future. A display cabinet is currently being made for the boots and when it is ready, they will be put on show in the Black and Gold Lounge at Pittodrie Stadium. It is thanks to the support and donations of fellow Dandies that we are able to bring artefacts like these into the Aberdeen Collection - long may that continue.